THREE DONEGAL MEN have gone where not many Donegal men have gone before – on a 1,000 mile trek over Alaska’s ice roads, and all in the name of charity. Denis Ferry, Les O’Donnell and Paul Doherty travelled from the most northerly point of Ireland, Malin Head, on 28 March to the most northerly point of America, with Paul capturing their journey as they went. They spent four days in total travelling on a 1,000 mile, four-day journey in Alaska, driving across the Dalton Highway, the tundra and the frozen arctic ocean, and have raised at least €25,000 in their efforts. Ferry, a Dunfanaghy native who runs a garage, and O’Donnell from Letterkenny, who runs a bodyshop, brought photographer Doherty on board to document their trip. In order to ensure that every cent of the money raised goes to charity, they were helped out by generous businesses including Ford, who paid for their jeep rental, Top Oil who paid for their fuel, and other local businesses who helped out in different ways. The men paid for their own flights and trip. After their return last Sunday night, photographer Doherty told TheJournal.ie that he “just jumped at the opportunity” when asked to document their trip. The Atigun Pass was probably the most dangerous part of their journey, and involved driving up and over a mountain on roads covered in snow and ice, with drops measuring 500 – 600 feet next to them. They also drove through an area called the Tundra, which is “basically like a desert full of snow”. O’Donnell and Ferry shared the driving and luckily did not experience any major issues – besides a broken pipe on the way back. With temperatures reaching as low as minus 50 degrees celsius, the broken pipe would disastrously have led to a lack of heating in the jeep had it not been fixed. The worst thing to happen besides that? Their luggage going missing, meaning they had to buy new coats to protect themselves from the frigid cold. On the return journey, the got caught in a white out, or blizzard. It was something you don’t usually get yourself into. You’ve got to keep driving on as fast as possible. The money, which Ferry said is expected to reach in excess of €25,000, will be evenly split between Friends of Letterkenny Hospital’s COPD Unit, Cairde le Chéile and Donegal Hospice. Ferry told TheJournal.ie that some of the inspiration came from the History Channel show Ice Road Truckers. He and Les usually travel to the USA every year, and he had already visited 48 states – so he wanted to do something different this year. I’ve always known the road was there, it was a thing I always wanted to do. It’s the third most dangerous road in the world. “It was an awful lot of organising – I was on the phone to Alaska once a week for the last four months,” said Denis, adding that it was worth every second. Everything worked amazingly well, but at the same time I think it worked so well because we put so much effort in to make sure it would work so well. They even got help from the experts Jon Norton and Phil Kromm at Carlile Trucking, from the show Ice Road Truckers, who taught them about CB radio etiquette. The aim was to be safe, know what to do in every eventuality, and “to blend in as much as possible”. The men have families and didn’t want to take risks, so they even spent time with Donegal mountain rescue to learn survival tips. Thanks to Carlile Trucking, they had a ‘cheat sheet’ that showed them every part of the road they would be travelling, and they could use this to let people know by CB radio when they were coming to a tight bend or other dangerous area. As the trucks and jeeps can’t brake because of the icy roads, this information and communication is essential. 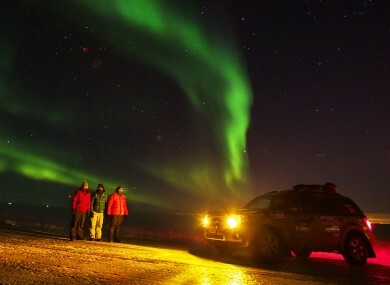 They also got to see the incredible Northern Lights, which was a highlight for the trio. “We are so happy that everything we planned worked out and we came back as happy as we left,” said Ferry, adding that everybody they met in Alaska was very supportive. This won’t be the last we’ll hear from these intrepid travellers – they are already thinking about their next trip. An event will be held held in Mount Errigal Hotel in Letterkenny on 26 April where the men will show the video recorded by Doherty, and raffle off a range of prizes. Email “Ice road trekkers' epic journey raises thousands for charity”. Feedback on “Ice road trekkers' epic journey raises thousands for charity”.